It is a scientific success story that started approximately 40 years ago – and was initially met with skepticism. Although the pioneers of mesenchymal stem cell research were initially criticized, today thousands of publications and hundreds of clinical trials focus on multipotent cells. New research is suggesting that in the end, not all MSCs are equal. It can take time until a revolutionary idea takes hold. This means that pioneers with ideas and concepts ahead of their time often receive no recognition during their lifetimes (Afanasyev et al., 2009). This was the situation for the godfathers of experimental hematology, Alexander Maximow (1874-1928) and Alexander Friedenstein (1924-1998). They laid the experimental groundwork for the transplantation of hematopoietic stem cells and the cellular therapies that followed. Maximow’s initial research gave invaluable scientific gifts to Friedenstein, who was able to advance these ideas. Today Friedenstein is credited with the discovery of mesenchymal stem cells (MSCs) (Afanasyev et al., 2009). Learn more about how uniform characterization of MSCs can be applied for improving culture performance and research progress. Download our poster now! Both Maximow and Friedenstein’s work were confronted with significant skepticism. Today, however, thousands of publications dealing with MSCs can be found in the PubMed database from the US National Library of Medicine at the National Institutes of Health. In 2016, alone, approximately 6,000 publications were added. Dr. Hagen Wieland has seen significant changes in his field of research. 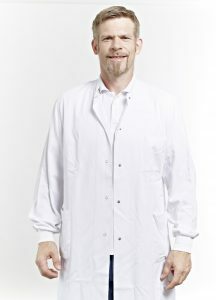 Today he works in the Research and Development Department at PromoCell. “I’ve been working with MSCs for more than ten years,” explains Dr. Hagen Wieland from the development department at PromoCell. “In that time, the technologies for this field of biological research have advanced. The cells have been used extensively, but regarding fundamental knowledge of MSC physiology, we’ve seen few new insights,” he adds. MSCs are adult stem cells, and the current state of knowledge is that they might originate from perivascular cells that are harbored in the walls of the blood vessels (Crisan et al., 2008; Oh and Nör, 2015). “We can find MSCs in virtually every tissue type – closely linked to the amount of blood vessels. Their task is tissue homeostasis, and therefore, their presence is vital for the body to function,” says Wieland. Human mesenchymal stem cells are multipotent, as they can differentiate into cells of mesodermal lineage, such as osteocytes, adipocytes, chondrocytes, and myocytes, as well as of ectodermal (neurons) and endodermal lineages (hepatocytes, insulin producing β-cells) (Ullah et al., 2015). However, distinct stem cell populations may function differently and exhibit a varying potential to differentiate. Whether those differences result from donor variation, cell culture or intrinsic properties remains elusive. “When we isolate MSCs from different origins, we find differences. Cells from adipose tissue can be CD34-positive, a contradiction to the criteria of the International Society for Cellular Therapy,” explains Wieland. Recent studies have shown that expression of that marker depends upon cell origin, culture conditions and passage number (Lin et al., 2012). “I don’t believe that there is only one type of MSCs. I think we are facing different subgroups. But MSCs from the bone marrow are the prototype,” he adds. Multipotency of mesenchymal stem cells: These adult stem cells can be derived from various tissues and organs. They show the ability to differentiate into a number of cell types, such as myocytes, neurons and osteoblasts. Defining criteria of mesenchymal stem cells: The International Society for Cellular Therapy (ISCT) has established particular markers and properties that distinguish MSCs from other cell types. Only with a detailed protocol of MSC origin, methods used and reagents, as well as the subsequent cell characterization, can experimental results across different laboratories be compared. There is an increasing awareness in the scientific community of the need to standardize mesenchymal stem cell research, particularly as many journals ask for authentication of MSCs before they accept papers for publication. Alexander Hackel, a PhD student at Germany’s Essen University Hospital, is well aware of the heterogeneity of MSCs, which is a central concern in this field of research. 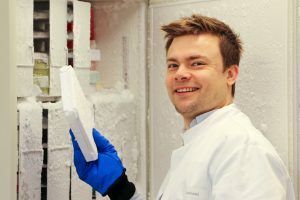 In Hackel’s own research, he is investigating the effects of different MSC types on natural killer cell and T cell immune function (Petri et al., 2017). “We are assessing the effects of MSCs in the context of autoimmune and inflammatory diseases such as graft-versus-host disease,” he explains. PhD student Alexander Hackel from Germany’s Essen University Hospital investigates the therapeutic potential of different MSC types. Picture kindly provided by Alexander Hackel. When researchers fully understand the mechanisms regulating MSC functions, they will be able to introduce more specific clinical uses. In 2013, hundreds of clinical trials using MSCs for cell therapy were performed (Wei et al., 2013). As with the graft-versus-host disease, they can be used to treat immune diseases such as Crohn’s disease, multiple sclerosis, amyotrophic lateral sclerosis (ALS) and stroke. Another important application is tissue repair. MSCs can be used to treat myocardial infarction and aid the regeneration of periodontal tissue defects; co-transplantation of MSCs and HSCs can be used to treat radiation victims. “Applications are so broad that MSCs could also help to treat a multitude of lifestyle diseases. Such cells could even help to treat Alzheimer’s disease and stroke patients,” adds Wieland. In particular, diseases of the musculoskeletal system are responsive to mesenchymal stem cell therapies. Using adult stem cells, doctors could treat patients suffering from osteoporosis and slipped disks, or who have other joint issues. Different methods of MSC isolation and expansion make it difficult to compare study outcomes. Learn more about how uniform characterization of MSCs can be applied for improving culture performance and research progress. PromoCell hMSC-BM are harvested from normal human bone marrow. The cells are tested for their ability to differentiate in vitro into adipocytes, chondrocytes, osteoblasts, and neuronal cells. PromoCell's hMSC-BM cells show a verified marker expression profile that complies with ISCT* recommendations, providing well characterized cells. PromoCell offers a complete Mesenchymal Stem Cell Media System including growth media, differentiation media and human mesenchymal stem cells (MSC). The PromoCell MSC Growth Media are designed to robustly support the standardized expansion of multipotent human mesenchymal stem cells. Rigorous quality control tests ensure reliable and consistent product quality. Useful selection of natural and synthetic small molecules for stem cell research. They have been proven to affect diverse cellular processes from signalling to differentiation, DNA replication, tumor metastasis and apoptotic processes.